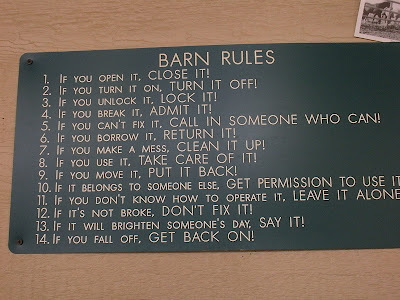 Barn Rules! Rules to live by! 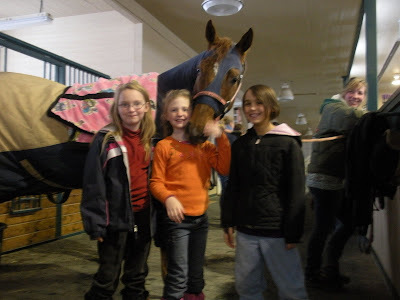 Jessica and Rebekah from the BCK's and Addy from Careywood Eager Beavers with one of the clinician horses, "Peg." 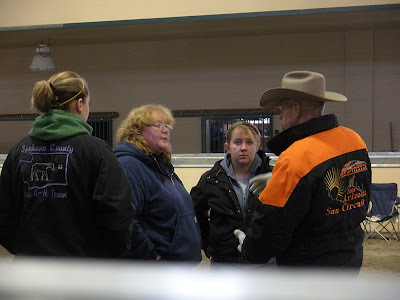 Annette and Lenora talking with the showmanship clinician. The Bonner County Clan, bundled up and ready to learn with paper and pencil in hand. Today was a COLD day for some die hard 4-H kids and a few adult leaders! After rising early (7am!---I know, really??) and getting the chores completed, cell phones and digital camera batteries charged, we loaded the little red mini van with folding camping chairs, snacks, blankets, kids and adults, and went on our way. We stopped near the end of the road and picked up 2 more passengers, and all their gear. We were headed to Hayden Idaho for a Showmanship Clinic. What were we thinking?? It began snowing in earnest, but the chatter in the van over whelmed any nerves threatening to fray. We did pass a terrible accident on the south end of Granite Hill and we quickly said a prayer for all involved and thanked the Heavens for the grace of timing. The chatter picked up again and the printed directions were shoved into the capable hands of the front seat passenger. Soon we were executing a u-turn and going back to the barn that we thought must have been our destination the first time we passed it. They really should make the address numbers much larger on those barns. Anyway, we realized we were the guests at an amazing ranch. We were all completely awestruck with the shear beauty of the facility. Gail Silkwood of the Golden Go-4's 4-H club, organized an amazing day for all the Northern County 4-H clubs to attend, FREE of charge. The clinic, sponsored by a grant from the AQHA was held at Joy Richard's barn, 1221 Lacey Ave, Hayden Id. The facility was beautiful! The rider's lounge, where we assembled to sign in was well appointed with leather couches, beautiful artwork, a full kitchen and donuts and hot chocolate and coffee. 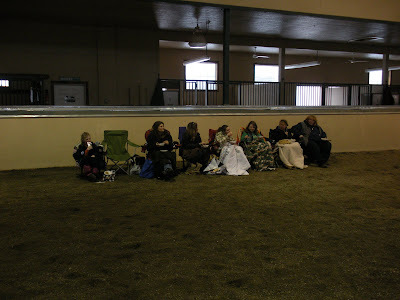 We signed our group in and went to collect our chairs and blankets which we placed around the perimeter of the indoor, HEATED arena. The stalls on either side were amazing. Automatic waterers and feeders, beautiful runs....ahhhh, what a life! The arena floor was chopped up rubber, NO dust! 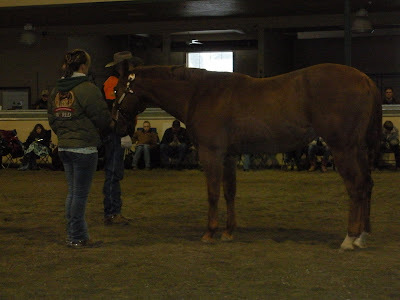 The clinic began with an instructor teaching about showmanship from the very basics and on up. The kids learned tricks for training their horses how to square up (HOURS and HOURS of practice!) pivots, leading, increasing/decreasing your horse's speed and that showing your horse to the judge as best as your horse can look...clean, tidy, well mannered. The clinic then moved onto Horsemanship and what the judges are looking for. We learned some tricks to begin training for lead changes and a very key statement to take to heart, "Its not IF something is going to wrong in the show arena, its WHEN." and how important that makes it that your horse is listening and responding to you. Then we had a FREE lunch! Hot chili with all the fixins'. and sweet treats. Even though the barn was heated, it was still pretty darn chilly and the hot chili was welcomed with smiles and cupped hands. After lunch, two trail judges and instructors came out on their horses and taught the kids the fine points of trail. I am excited to try trail with my horse now! I only need to figure out how to let her know that the gate I am trying to open by pulling towards us is really not going to eat her! After trail was a short clinic on Western Pleasure riding. This class probably sparked the most conversation on the drive home, with the "draped rein" and the "peanut rollers" and the "4-beats" as we jokingly call them, and the pro's and cons of each characteristic of top Western Pleasure horses. All in all we had a terrific winter day immersed in the world of horses. Of course the husbands of the adult attendees now have to listen to the wishes of their wives for indoor arenas, automatic water and feeding systems and rubber footing for those non-existent indoor arenas.